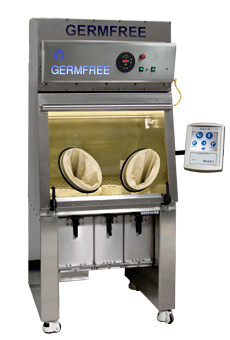 Germfree’s VersaFlow is a Laminar Flow Compounding Aseptic Isolator. The VersaFlow provides the most practical and versatile solution for I.V. compounding in the hospital pharmacy and cleanroom.While operating under positive pressure, the VersaFlow functions as a Compounding Aseptic Isolator (CAI) to meet USP 797 regulations. The complete work area and transfer chamber is bathed by HEPA-filtered air, protecting the product from contamination. The Laminar Flow Compounding Aseptic Isolator/Vertical Laminar Flow Workstation (VF) provides ultimate product protection. The Versaflow functions as a Compounding Aseptic Isolator (CAI) while operating under positive pressure to meet USP 797 regulations. HEPA filtered unidirectional (laminar) air bathes the work area and transfer chamber in order to protect the product from contamination removes any particulate generated by sample manipulation. The Versaflow Series of barrier isolators meet or exceed ISO 14644-1 Class 5 air quality. Each Versaflow, before shipping, undergoes rigorous physical testing to assure the unit meets performance requirements. It is required that independent certification be performed before use. 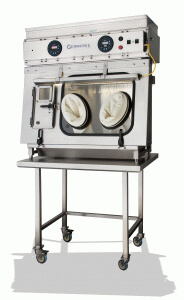 The Laminar Flow Glovebox/Isolator provides ultimate product and personnel protection. 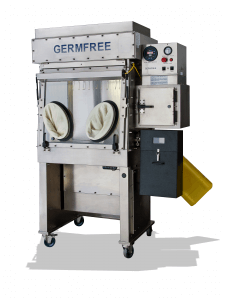 Germfree’s LFGI functions as a Compounding Aseptic Containment Isolator (CACI) while operating under strong negative pressure to meet NIOSH recommendations. Additionally, the unit functions as a Compounding Aseptic Isolator (CAI) under positive pressure to meet USP 797 regulations. The operator is provided a complete barrier from the materials being manipulated through a highly ergonomic glove system. The Laminar Flow Glovebox/Isolator (LFGI) uses HEPA (High Efficiency Particulate Air) filters to provide the highest level of operator and product protection. The supply HEPA filter provides laminar flow air which bathes the entire work area. The exhaust HEPA filter handles all air exiting the Laminar Flow Glovebox/Isolator. Additionally, there are two HEPA filters located inside the HEPA Purge airlock that filter the purged air. All filters are rated to remove particulates and aerosols 0.3 micron in size with a minimum efficiency of 99.99%. These filters are even more effective at removing particulates both larger and smaller than 0.3 microns. The Laminar Flow Glovebox/Isolator provides personnel and product protection from particulates, dust, powders and aerosols. Microbiological particulates and aerosols, with the possible exception of Prions, are also removed. Operator and product protection from gas and fumes are NOT provided by HEPA filtration, but limited protection from gas and fumes can be provided by venting or ducting. In accordance with the NIOSH alert on the handling of hazardous drugs, the LFGI can be configured for no recirculation and total exhaust of all air exiting the work area. The LFGI Series of barrier isolators meet or exceed ISO 14644-1 for Class 5 air quality. Each LFGI undergoes rigorous physical testing before shipping to assure the unit meets all performance requirements. It is required that independent certification be performed before use. The Germfree Shielded Isolator provides the ultimate product and personnel protection. The Shielded Isolator functions as a Glovebox while operating under negative pressure to meet NIOSH recommendations while complying with USP 797 regulations for operation outside of a cleanroom. HEPA filtered unidirectional (laminar) air bathes the work area to protect the product from contamination and removes any particulates generated by sample manipulation. The operator is completely shielded from materials being manipulated in the work area. The Germfree Shielded Isolator meets or exceeds ISO 14644-1 Class 5 (Class 100) air quality under dynamic conditions. Each Shielded Isolator undergoes rigorous physical testing to assure the unit meets performance requirements. Independent certification is required before use. Unidirectional laminar airflow system maintains ISO Class 5/Class 100 air quality under dynamic conditions. Germfree’s VersaFlow Countertop (VF-CTUSP) is ideal when additional space is limited. The unit is useful for low volume Sterile IV Compounding operations.